Almighty and eternal God, who made the Priest Saint Christopher Magallanes and his companions faithful to Christ the King even to the point of martyrdom, grant us, through their intercession, that, persevering in confession of the true faith, we may always hold fast to the commandments of your love. Through our Lord Jesus Christ, your Son, who lives and reigns with you in the unity of the Holy Spirit, one God, for ever and ever. Saint Christopher Magallanes was joined in martyrdom by twenty-one diocesan priests and three devout laymen, all members of the Cristeros movement, who rose up in rebellion against the anti-Catholic Mexican government during the 1920s. Having erected a seminary at Totatiche, he secretly spread the Gospel and ministered to the people. Captured by government authorities, he was heard to shout from his jail cell: "I am innocent and I die innocent. I forgive with all my heart those responsible for my death, and I ask God that the shedding of my blood serve the peace of our divided Mexico." This optional memorial is new to the USA liturgical calendar and will be inscribed on May 21. 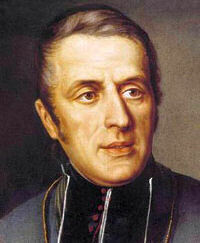 St. Eugene De Mazenod, refused to follow the established modes expected of someone born into nobility. From an early age, Eugene was troubled by the living conditions of the poor and their degraded status in society. When he became a priest, Eugene was not satisfied to accept the traditional role of a pastor serving a large, affluent parish. Instead, he sought out the poor laborers and preached the message of God’s love — a message they had not heard before. Born in France in 1782, Eugene lived amid turmoil in his country and in his family. Although he grew up with the privileges and luxuries of wealth, his family life was far from ideal. His parents came from very different backgrounds and they eventually divorced, a rarity for Catholics in the 18th century. As the French Revolution grew, Eugene’s family was forced into exile, and at different times, he was separated from his mother or father for years at a time. After years of struggling to find his place in life, Eugene experienced a conversion at the age of 25 and entered the seminary. He was ordained a priest in 1811. In 1816, Eugene invited others to join in his ministry to the poor and founded the Missionary Oblates of Mary Immaculate. Since that time, thousands of Oblate priests and brothers have dedicated their lives to serving those most in need. He died on May 21, 1861. On December 3, 1995, Pope John Paul II canonized Eugene De Mazenod a saint and recognized his example of untiring dedication to the poor. Learn more about St. Eugene. Like Blessed Miguel Agustin Pro, S.J. (November 23), Cristobal and his twenty-four companion martyrs lived under a very anti-Catholic government in Mexico, one determined to weaken the Catholic faith of its people. Churches, schools and seminaries were closed; foreign clergy were expelled. Cristobal established a clandestine seminary at Totatiche, Jalisco. Magallanes and the other priests were forced to minister secretly to Catholics during the presidency of Plutarco Calles (1924-1928). All of these martyrs except three were diocesan priests. David, Manuel and Salvador were laymen who died with their parish priest, Luis Batis. All of these martyrs belonged to the Cristero movement, pledging their allegiance to Christ and to the church that he established to spread the Good News in society—even if Mexico's leaders had made it a crime to receive baptism or celebrate the Mass. These martyrs did not die as a single group but in eight Mexican states, with Jalisco and Zacatecas having the largest number. They were beatified in 1992 and canonized eight years later. — Excerpted from Saint of the Day, Leonard Foley, O.F.M.